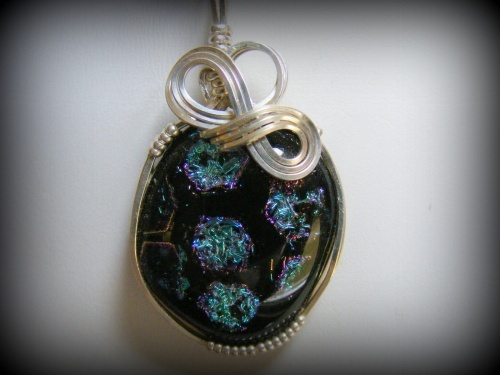 This piece of handmade dichroic glass has pretty dots of flashy blues greens and pinks that sparkle like diamonds against the black background. Truly one of a kind pieces. Sculpted in sterling silver with curls on top of the pendant. Piece measures 1 3/4" from top of bail to bottom of pendant and 1" across. Comes with a sterling silver snake chain.